Facebook news feed turns 7: Why it’s the most influential feature on the Internet. Media. Advertising. Politics. And us. 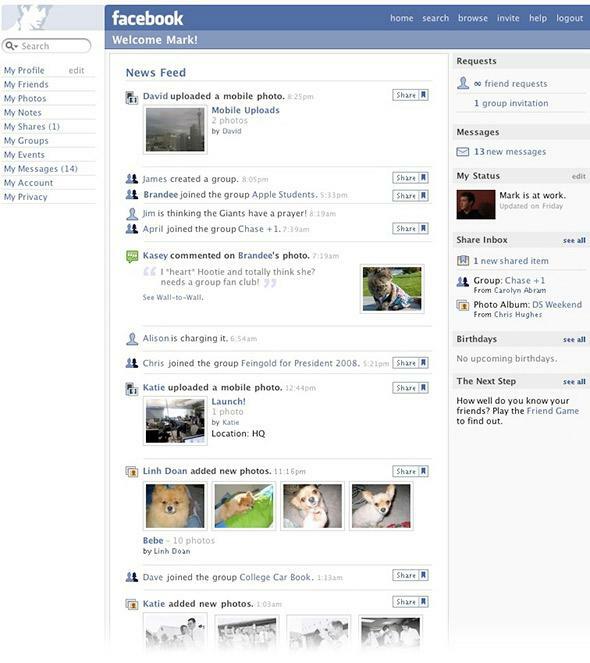 In the time before news feed, the Web was a strange, quiet, and probably very lonely place. I say “probably” because I can barely remember the way things worked back then. After Facebook launched news feed, nothing on the Web would ever be the same again. Yes, that sounds over-important. But consider this: Thanks to news feed, I learned today that that this one dude I barely knew in high school just had a baby. I know what his half-clothed wife looked like just after labor. I’ve seen his mother-in-law. I’ve seen his infant daughter. Is such forced, daily, crushing intimacy good or bad for the world? None of us can say for sure yet. Either way, though, it’s hugely consequential—because we now know everything about everyone, the way we relate to one another has changed enormously, and permanently. She was right. News feed was different—so different that people immediately hated it. News feed sparked the first of many major privacy firestorms for Facebook, the first time people questioned how the information they were posting on the site might be used by others. A few days after it launched, amid a storm of protest, Mark Zuckerberg posted a mea culpa (also the first of many) in which he promised to tweak Facebook’s privacy controls to mitigate some people’s worries. But Facebook didn’t get rid of news feed, because however loudly people protested, the company could see that people loved it. By turning a series of lonely events into something like a story—by combining all your friends’ actions into a community, or even a conversation, on your home page—news feed gave Facebook a soul. Thanks to news feed, people started finding one another and working together in ways that had never happened on the site before. “Before news feed, you could join groups, but discovering them was not super easy,” Cox explained at a recent Facebook press event. “Within a period of two weeks after the news feed launch we had the first group with over a million people—which means a million people had seen the group and taken an action to join it.” There’s a punch line to this story that’s a testament to our enduring ambivalence about news feed. The first Facebook group that news feed propelled to million-plus membership was a protest against News Feed. But EdgeRank wasn’t sophisticated enough. Ideally, everyone’s ranking algorithm should be personalized, and news feed should recognize those preferences and tweak our stories accordingly. “A few years ago, we stopped working on EdgeRank, and started working on a machine-learning approach,” says Serkan Piantino, the engineer who worked on some of news feed’s earliest ranking systems. Now, every time you load up news feed, the new system takes thousands of factors into account to present a feed that is personalized to your tastes. The machine-learned algorithm constantly tweaks itself based on how you interact with it: If you click like on a lot of memes, you’re going to see more of those. For every user, the system has to instantly analyze and rank an average of 1,500 posts every time the site is reloaded. And engineers keep making the system more complex. Lars Backstrom, the engineering manager for news feed ranking, says that one of his team’s current goals is to get news feed to present information that hasn’t been explicitly shared by your friends. For instance, say you love Ricky Gervais, but none of your friends care for him. They aren’t likely to post anything about his new Netflix show—but given what news feed’s ranking system knows about your interests, it should determine that you might like Willa Paskin’s review of Derek more than you might like, say, another post about your mom’s friend’s visit to the Hamptons. “If something really interesting happens in the world, we should know enough about you to pull that in even if you haven’t explicitly connected to it,” Backstrom says. He adds that news feed doesn’t really do this yet, “because we aren’t very good at it.” But the fact that Facebook is working on this problem illustrates the scale of its ambitions for news feed. Facebook doesn’t just want to be the front page for your social life; ultimately, it wants to be the one place online you check for everything you care about. You can question whether this is good for society. One persistent worry about the news feed approach to information is the Filter Bubble critique—the idea that by engaging only with stuff that’s been algorithmically determined to appeal to us, we’re all tunneling into echo chambers of our own preferences. I explored that critique in my own book, though research into the question has since shown that the bubble is, thankfully, more porous than we might fear. Another critique of news feed is that it has turned us all into narcissists, and worse, that it’s making us depressed about how much better everyone else’s life is. The trouble with that critique is that News Feed is only a reflection of your own interaction with it: If it’s serving up stuff that makes you sad, it’s only because that’s the stuff you’re most engaged with. If it’s true that news feed drives us crazy, we theoretically have the power to fix it. The news feed we have is the news feed we deserve.